Please indulge me as I get a little personal. Andrew Skurka is one of my demi-heros—someone who inspires and motivates me to be my best and try a little harder. I also, selfishly, live vicariously through his adventures. He’s one of those people who just seems to be able to do everything, with seemingly limitless energy and passion. If you haven’t heard of Skurka, at age 27 ye was named Adventurer of the Year by National Geographic and has made a name for himself for his epic, long-distance hiking treks. He has proven his expertise through the crucible of the trail and has made his experience available through his lectures and writings. 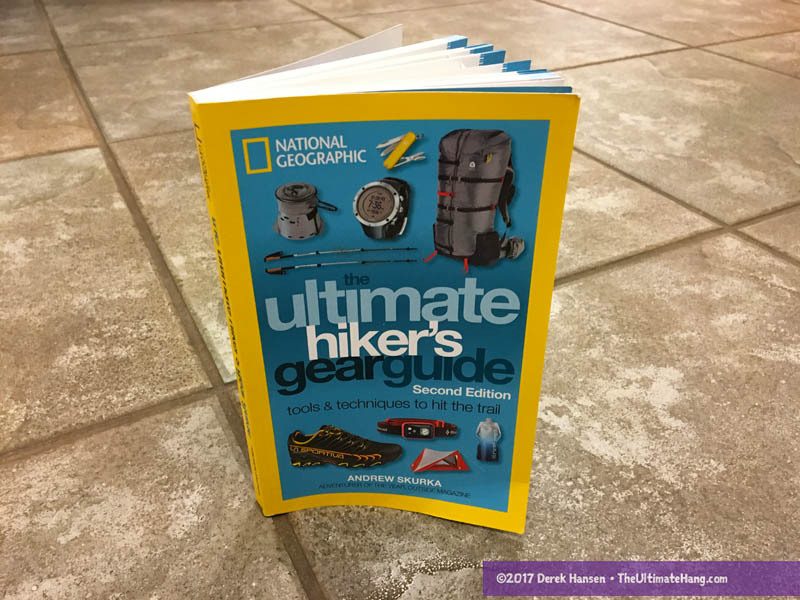 Earlier this year, Skurka published the second edition to his popular trekking guide, the Ultimate Hiker’s Gear Guide, and I was fortunate to get a copy to review. Unfortunately, I received my copy right in the middle of editing and illustrating the second edition of my own book. These obligations didn’t allow me much time for extracurricular reading, so I had to wait to do a full review until now. Where do you want to be most comfortable? In camp or on the trail? Where campers may focus on bringing extra comfort items that may result in a bigger, heavier pack load, hikers will focus on bringing less or choosing lighter options so hiking is more enjoyable, all without sacrificing safety or comfort. While Skurka’s book is aimed squarely at those who want to hike more than camp, the ideas and principles are quite thorough enough for any trip type. I admit that I’m much more comfortable hiking than camping (honestly, I get bored sitting in camp! ), and as an avid lightweight backpacker, I found the book very useful to help me make better choices and try new techniques. The chapter of the book that has been the most meaningful to me right now is on food and nutrition. It’s one of my own weaknesses when planning longer trips to balance the right nutrition but also make sure it is, as Skurka describes, “calorie dense” but also nutritious, tasty, long-lasting, among other factors. It’s been a huge help to me to take advantage of Skurka’s bredth and depth of experience and research. Skurka’s book is well-organized and well-written. He does an expert job setting the case and then answering the “what” and “why” of specific gear, but also techniques on how to use them. Throughout the book are handy comparison charts on specific gear options. He also sprinkles his top “picks,” highlighting his favorite gear choices, along with his rationale. This book is like an adult version of the Boy Scout Handbook, although Skurka only lightly covers some topics, such as first aid. And as he focuses on hiking vs. camping, campcraft is all but avoided. The Gear Guide stays hyper-focused on helping the reader make critical choices regarding gear to help you enjoy hiking more. One thing I really appreciate is Skurka’s balanced approach. I respect his view on lightweight camping, for example, where he admits that going light for light sake can lead to “stupid light” decisions that could put you in danger. These are concepts I heartily agree with, and wrote about in my own way in my book as well. He also addresses the idea of “packing your fears” where people tend to pack “extra” items because of their insecurities, doubts, or inexperience. The book helps to mitigate those issues by arming the reader with enough information to lower risks and hopefully give folks courage to trust the right gear, based on Skurka’s recommendations. Of course, no review of mine would be complete without some focus on hammocks 🙂 When I first met Skurka, he was ambivalent at best with regards to hammocks. When he moved to Colorado, he was introduced to another acquaintance of mine, Brandon Waddy, founder of Warbonnet Hammocks. After a few skeptical introductions, Skurka saw the light, so to speak, and has adopted hammocks in many of his trips and guided tours. He even lists his own favorite hammock in the book—the Warbonnet Ridgerunner—that he admits to taking on many trips. Since I wrote the original manuscript, backpacking changed and so did I — new products and brands, and new personal experiences and insights. Some of those new insights include the hammocks he personally uses and recommends for hiking and camping. He actually does a great job summarizing the strengths and weaknesses of hammocks that hiking-focused adventurers would want to know. I respect that Skurka is transparent and honest about adapting to change. I also appreciate his shout out to the Ultimate Hang—a resource he recommends to help level out the steep learning curve that comes with hammocks. I highly recommend picking up a copy of the Ultimate Hiker’s Gear Guide for anyone serious about making a difference in how they backpack and hike. Skurka has real-world experience and advice on how to make smart choices about what you take into the field. He has proven to be level-headed, balanced, and honest with his advice. Campers will also find a lot of value in the book, by learning new techniques or trying out tips as they consider going light. The fact that he recommends hammocks for specific trips is just icing on the cake.